If you were given a special “offer” of a 30 per cent discount on all Tata group shares relative to their current market prices, would you take it? How? Here's the article from The Hindu Business Line explaining how you can get blue chip stocks at discount! Well, it is exactly such opportunities that you get to capture when you buy the holding or investment arms of India's key business groups. Take Bajaj Holdings and UB Holdings, the holding companies of the Bajaj and UB groups. They hold investment books which are worth Rs 16,000 crore and Rs 5,500 crore respectively at today's market prices. Yet the stocks sport market capitalisations that are at a steep discount to this value, at Rs 6,500 crore and Rs 1,800 crore respectively. These are not odd cases, there seem to be many more instances where the holding or investment companies of business groups are trading at a steep discount to the real value of their investment book (the Net Asset Value, NAV). As the Indian market continues to tread higher, investors are finding it harder to spot undervalued bets in the market. The enormity of information available has also led to most of the undervalued stocks getting re-rated. However, one pocket of stocks which continue to trade at a steep discount to their intrinsic value are investment and holding companies of major business groups. In addition, there are also other companies (such as Ramco Industries and Aditya Birla Nuvo) with large investment books (quoted) which supplement their core business. Business Line's analysis of these companies indicates that the companies trade at a steep discount to their NAV (ranging from 35 per cent to 80 per cent). They have also underperformed (in some cases delivered negative returns) the broader market index over the last four years. From the investment data in the balance-sheets of listed companies, around 27 companies' market capitalisation is less than their respective investment book value. 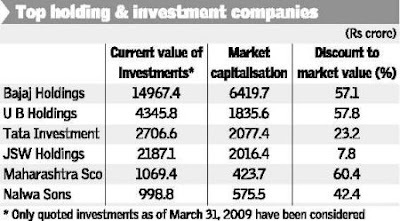 Of which, 14 companies are mainly holding and investment companies whereas others (such as Rajapalayam Mills and Binani Industries) also operate separate standalone businesses. The assumption is that these companies have not made material changes to their investment holdings since March 2009. The stock market prices of holding and investment companies are all at a discount to the underlying value of investments they hold — with stock prices amounting to 20-65 per cent of their quoted investment book per share. If unquoted investments are taken into account, the discount would widen in many cases. Assuming that the companies have not liquidated their stakes since March 31, 2009, JSW Holding and Tata Investment Corporation are trading closest to their NAV, at a discount of 8 per cent and 24 per cent to their respective quoted portfolios. On the other hand, Williamson Magor (with major investments in Mcleod Russel, McNally Bharat and Eveready Industries) and Nagreeka Capital (with investments in Sterlite Industries) are trading at less than one-fifth of their investment book. Stocks such as UB Holdings and Nalwa Sons are trading at almost half their investment values. The discount seems to be wider for smaller rather than larger holding companies. The implied discount may be even higher in some cases as the holding and investment companies may have cross-holdings. For instance, JSW Holdings, apart from the steel portfolio, also has investments in Nalwa Sons, which is already at a discount to its own investment book. Bajaj Holdings and Maharashtra Scooters have stakes in each other, in addition to investment in Bajaj Group stocks. Where there are multiple holding companies within a group, investors may find the one at a steeper discount a better bet. For instance, between Nalwa Sons and JSW Holdings, the discount in Nalwa Sons is higher as compared to JSW Holdings making it better value. Same is the case with McDowell Holding which is trading at a higher discount to its fair value compared to UB Holdings. Though the investment companies are available at an attractive discount, their long term stock performance hasn't been very encouraging. Over the last four years as the broader market index BSE 500 gave a 13 per cent annual return, quite a few holding companies and investment companies have given negative returns. JSW Holdings, Nalwa Sons and HB portfolios were exceptions with an annual return of 75 per cent, 27 per cent, and 14 per cent respectively. However, the market does seem to be turning its attention to these companies. Some investment companies do seem to have gained market favour, delivering higher than market return (BSE 500) in the last one year. For instance, UB Holdings and Maharashtra Scooters gained 260 per cent and 350 per cent respectively as against the 100 per cent return of BSE 500 index. Good performance of the underlying stocks has been reflected in the stock price gains of Nalwa Sons and JSW Holdings which hold all the listed companies of the JSW group. HB Portfolio too has gained as it holds JP Associates, a high beta stock. Analysis also shows that historically the discount on the holding companies narrowed more during periods of market correction (underlying companies' stocks falling) rather than during market highs. That is the underlying stocks have usually outperformed in a rising market and fallen more in a bearish market. For instance, Nalwa Sons and Jindal South West Holdings saw their stocks trading at a premium to their underlying NAV of the stocks during the period January-March 2009, when JSW Steel, Jindal Stainless and Jindal Saw touched their multi-year lows. Why the discount? Holding or investment companies may be a good way for investors to buy blue-chips at a discount. For the holding company to be a good “buy” the underlying stocks should be worth investing in, the prospects of the underlying businesses should figure prominently in the investment decision. Holding companies are similar to the perpetual close-ended mutual funds which have never paid dividends. Their stocks trade at a discount because the value of the investments is essentially on paper. It is the promise of value unlocking that can really serve as a trigger for the discount to narrow. This can happen through periodic liquidation of holdings or a delisting of the company itself. Even the dividends paid out by the holding companies are highly correlated to dividend received in turn from their holdings. Concentration is another risk the investors have to bear in mind. Investing in a holding arm of a group means holding a number of companies from the same business group from different sectors. For instance, by holding Tata Investment Corp an investor will end up tracking the whole Tata group portfolio. However, given the choice investors may not want to bet on all the businesses at the same time. Same is the case with other holding companies too.